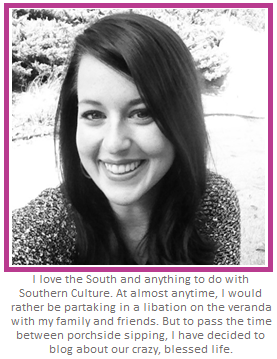 Brandi Nell the Southern Belle: Planking... the WALLS! Hi Friends! The Goodwood Reno (You can follow along with our full renovation process on Instagram using #GoodwoodReno) is still coming along. We are really serious about getting our house finished by the end of February. We are really buckling down on resources and time. Our friends will probably think we are hermits for the next few months, but it will be worth it in the end. 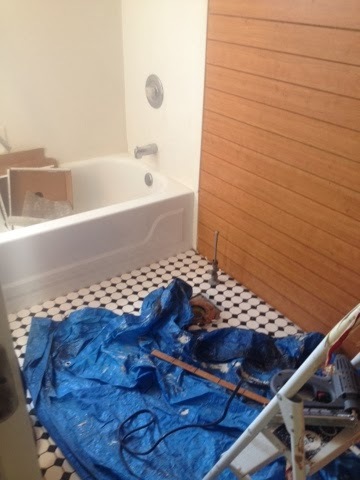 In a recent post, I showed you the carpet being ripped up (gross) and the new tile floor going in. I also must tell you that the past owners had wallpaper at one point. 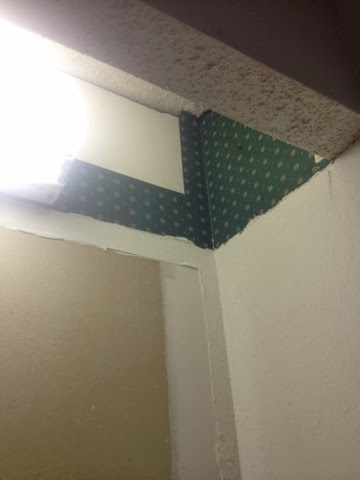 Instead of removing the wallpaper, they opted to cover it up with a terrible plaster texture, then paint over it. Y'all, the texture was bad... really bad. And I couldn't sand it off. I tried and tried. Finally, after lots of coughing (who knows what I was inhaling as I was trying to sand the stuff off), sore arms, and lots of terrible swear words, I had the idea to plank the walls - right over the ugly drywall. Hubs thought I was crazy when I told him I wanted to go buy some 1970s paneling. Once I showed him some Pinterest inspiration, he was on board to give it a try. We also thought paneling would be a good way to cover up where we had to rip out these ugly lighting soffits. The fluorescent lighting had to go. You can also see the orginial wallpaper here. We headed over to Home Depot and purchased THESE PANELS for right around $20/panel. Each panel was around 32 sq ft. It's a rather small bathroom, so we only needed five of them for the walls. Instead of installing them vertically (the traditional way to hang this type of panel), we decided to hang it horizontally to give it the farm/cottage/planked feel we were going for. We used an adhesive on the back of the panels and also secured them to the wall with a nail gun. You can see how we paneled over where we ripped out the soffit below. We also made sure to cut a hole for the new lighting we would be installing later. We also cut holes for the plumbing and electrical outlets as well. Once all of the panels were up, we gave them a good sanding and applied a primer to help the paint to adhere to the panels. We chose a gray color for the bathroom and used two coats to ensure none of the cherry wood color popped through. Luckily, we had the paint on hand from when we painted the master bedroom. Once the paint dried, hubs added base trim to the floor. We decided on a basic bright white trim. I apologize for the horrible iPhone quality, but you can see where we added most of the floor trim here. We still needed to add the shoe molding. 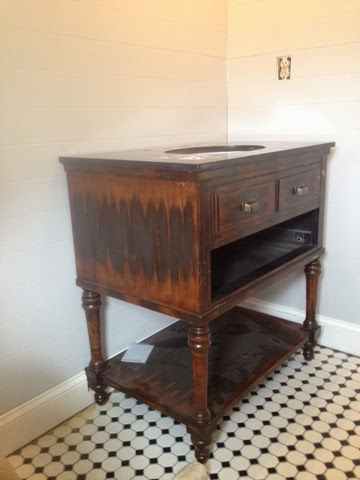 But, I thought I'd give you a sneak peek of what the vanity and sink look like in the space. Yes, the piece is covered in dust in this picture... my house is a construction zone. EVERYTHING is covered in dust at the moment. We found the vanity for less than $300 out a wholesale warehouse. We bought it months ago, knowing we would be renovating this bathroom soon. 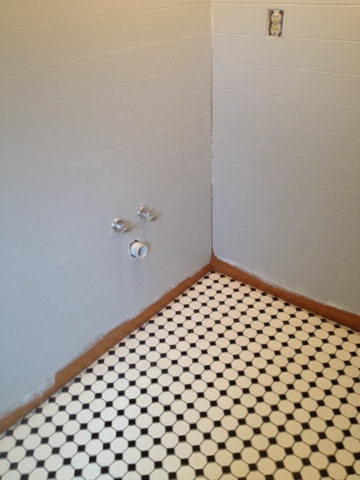 I'll be sharing the shower tiling with you guys next... then the trim work, crown molding and ceiling! This space has been so fun to work on. Hope you guys are having a great year so far! CHEERS to 2014! Talk soon, friends! I love what you did with this bathroom! I particularly love the use of the paneling on the ceiling. 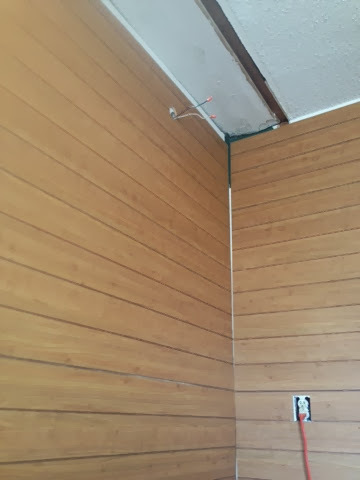 I've been looking for a budget friendly way of giving one of my rooms a planked ceiling. So I took a look at the link in your post to the planks. It specifically says they're not recommended for ceilings. Do you have any idea why? I can't imagine what the reasoning might be, but definitely curious to know.